I am so ready for Christmas this year! I never had that much Christmas content coming up on the blog. Usually, the maximum I do is a gift guide but this year I decided to go all out and started preparing quite in advance! 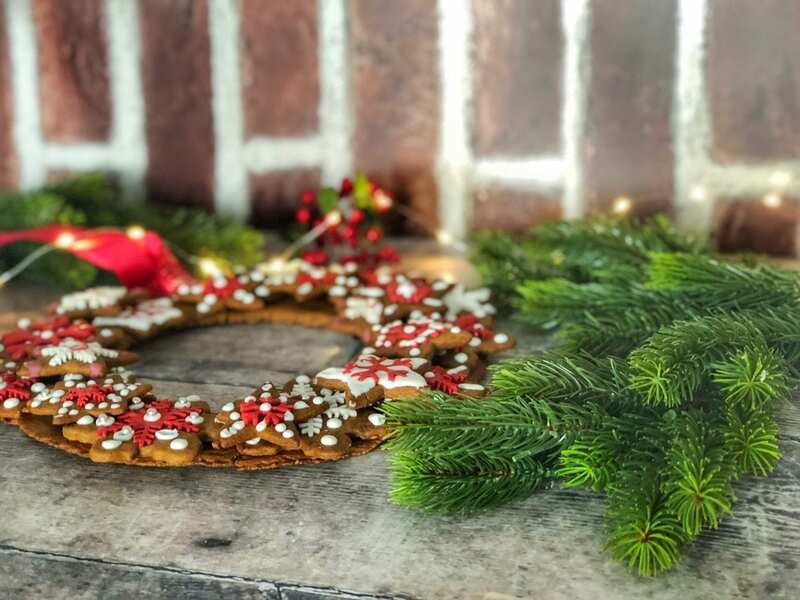 You’ve already read two of my Christmas recipes and here comes the third – a Christmas Gingerbread Wreath recipe! 1. The gingerbread. Mix together muscovado sugars, golden syrup and butter in a pan over medium heat. Bring to a boil and simmer for two minutes. Then, remove from the heat and stir in the bicarbonate of soda. The mixture will take a golden brown color and puff up. Let cool for 15 minutes. 2. Mix together the flour, ginger, cloves and cinnamon into a bowl. Add the syrup mixture, the milk and orange zest. Knead into a ball. Wrap in clingfilm and let rest in the fridge for 30 minutes. 3. Remove the dough from the fridge, let soften for a few minutes then unwrap. Pre-heard the oven (gas 4, 180°C, fan 160°C). Cut the dough in half. Use a rolling pin on the first half out on a baking paper to a thickness of 3mm. Put a plate in the dough and cut around to get a 22cm circle. Use a smaller plate to cut an inner circle. Remove the inner circle and add it to the remaining dough. Make a small hole at the top of the circle. 4. Roll out the remaining dough. Use your Christmas cutters to cut out 20 to 25 shapes of all sizes. Spread the shapes on a baking sheet lined tray and chill for a few minutes. Then, bake in batches for 10 to 12 minutes. Remove from the oven and let cool for 5 minutes. Detach the ring and the shapes from the baking paper and let rest on a wire rack. 5. The decoration. Thinly roll the red and white icing on a surface dusted with icing sugar. Use the Christmas cutters to get shapes of different sizes for their respective biscuits (or not, you can also mix match). Brush the back of the shapes with water and press on the biscuits. 6. Add drops of water to the royal icing so that it is thin enough to pipe. Divide between two bowls. Keep one white and add drops of red coloring to the other. Feel your piping bag with royal icing and decorate to your tasting. Let rest for an hour. 7. Sticking it all together. Cook the sugar in a pan over medium heat. Do not stir, let melt. use a brush or a spoon to add caramel to the back of the biscuits to stick them around the gingerbread ring. Thread a ribbon through the whole. 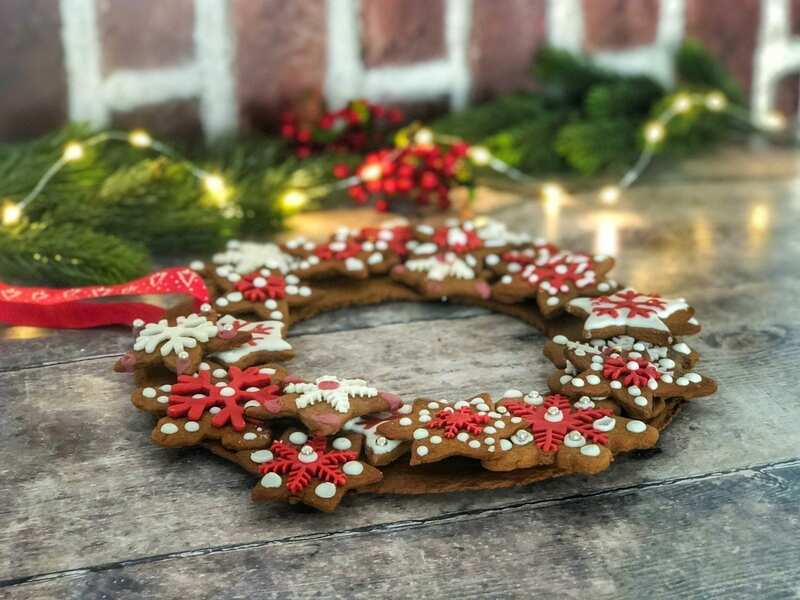 You can put the gingerbread wreath at the center of your Christmas table, or anywhere festive in the house. It can sit leaning against a wall but should not be hung. You can try but the chances that it falls and break are very high. I warned you. What do you think? Is that something you’d do? It’s actually not that heard but quite time consuming. Have you ever tried to build something out of gingerbread before? How Christmassy does this look?! I love gingerbread and especially around this time of year – puts you in the wintery and festive mood! Thanks for sharing such a lovely recipe, it looks so stunning too – almost too good to eat! How amazing does this look! You did such a gorgeous job! This looks amazing!!! And that a fun Christmas activity. Looks totally gorgeous–this is totally worth a try! x I can’t wait for a few days off work to give this a go! This is adorable! I love it! And my kids would love to help.put it together. The wreath looks gorg! Thank you for sharing the recipe–can’t wait for another day off work to give this a go. Baking can be a bit time consuming, but I’m totally sure making this one was worth every minute! You are getting me so excited for Christmas! What a terrific post and what great timing. I usually don’t get into the Christmas spirit until after American Thanksgiving — but this takes a little time and planning. Thanks so much for posting this now. Have a Merry Christmas! Oh wow this is absolutely stunning- I don’t think I’d want anyone to eat it if I’d spent all of that time on the icing! I’m loving your Christmas recipes by the way- you’ve already given me so much inspiration! The gingerbread looks like yummy and crunchy cookies which I just love! And I love how you top them up with such icing; absolute Christmas vibes! I love how this turned out! It’s so pretty and festive. Plus I just LOVE the smell of gingerbread, so I’ll have to make one. Omg, this is so awesome! I love it! This is the best time of the year to have gingerbread! This looks delicious! I’m not a huge fan of gingerbread so I’d probably make a sugar cookie version. Having said that my dad is obsessed with gingerbread. 🤔 Thanks so much for sharing – pinning for later. This is absolutely beautiful! I really want to do some more baking this Christmas and this looks fun to make. Thanks for sharing the recipe, I’ll let you know if I try it. This has to be the cutest thing I’ve seen all day!! Omg, I have to make this for the holidays❤️ Such a fun family activity also. Definitely saving this. This is such a great idea! 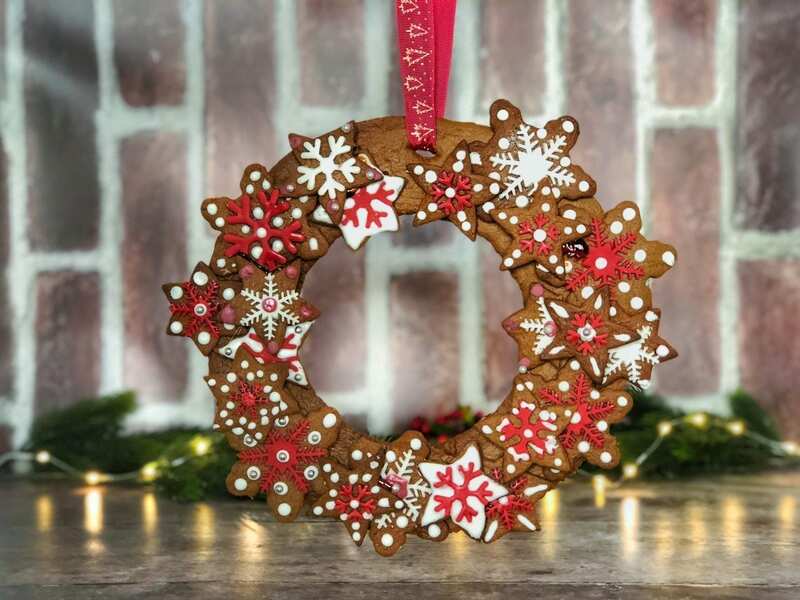 I love gingerbread, it’s so good in winter, and this looks so Christmassy and festive! You have decorated this really beautifully. I love your photos too. This is on my Christmas to do list now!! Great festive idea thank you!! An edible wreath with kids in the house? It does look stunning but it will be eaten in no time at all. It is such a lovely idea though. Thanks for sharing. That looks so pretty. Can it be eaten? If so it would make a great gift. Oh my goodness! I adore gingerbread, so this basically looks like my idea of heaven! Not sure I’m enough of a baker to try it myself but my sister is always up for a challenge – I’ll drop hints! 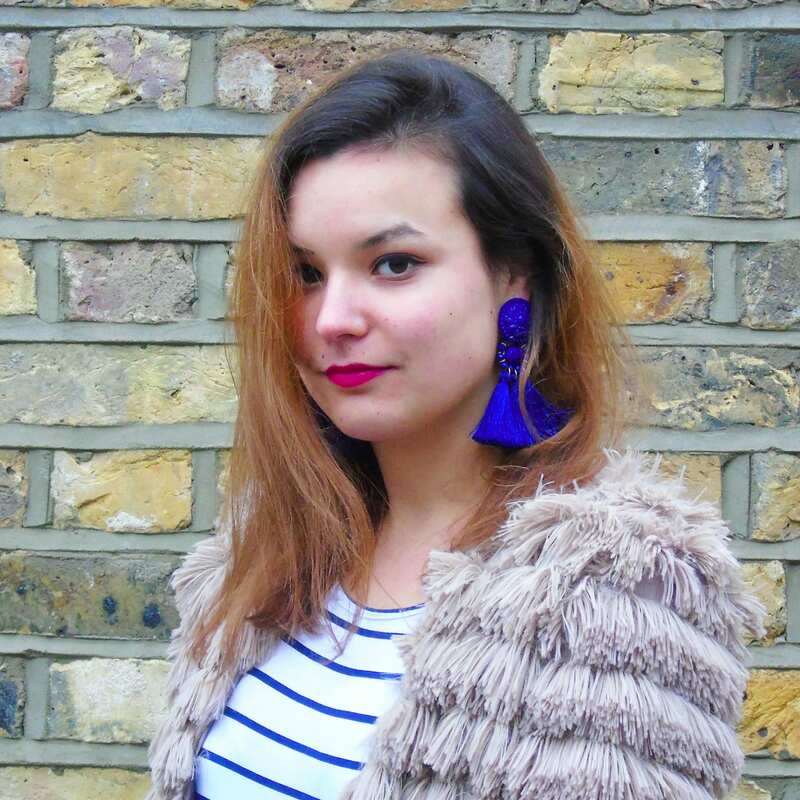 I think this might be the first post that has put me in a Christmassy mood – thank you! I would love to bake this. But my culinary skills are very questionable. But I am so tempted to try this. Wow what a beautiful wreath! I can’t believe you made that yourself! Such a simple but statement piece! This is definitely something I could see myself making in time for Christmas. Wow! What a cool wreath! This is a great activity to help get into the festive holiday mood. Thanks for sharing! This looks amazing as food, a decoration, or as a gift! I would love to make one of these. My kids would probably love to do it with me. Wow great idea! Wonder why it didn’t strike me 😊. We can create so many designs using this method. Yours looks lovely. Oh my! It looks so pretty. I wish I could be as creative and so something like that, but I am only limited to making easy cakes. Maybe this time I will give it a try. I love gingerbread but never thought about baking my own. I always buy it from the Christmas markets. 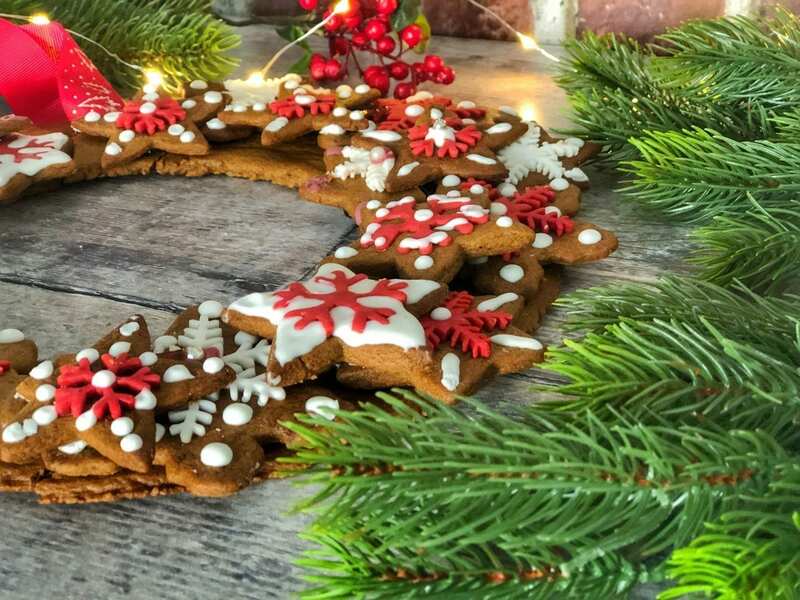 Your gingerbread wreath looks adorable though, too cute to eat! Your wreath is beautiful. It’s such a classic Christmas look. I’d love to make lots of tiny ones to go on my tree. 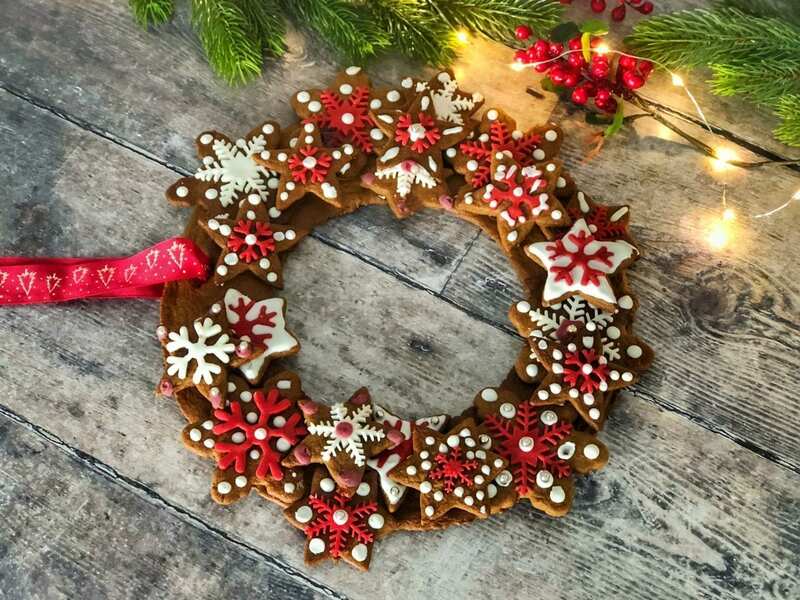 I’ve never seen such a beautiful gingerbread wreath in my life! This looks too cute to eat them. I’m feeling the Christmas vibes already! What a cute wreath! I LOVE gingerbread. Looks like such a fun family project! Now as the Christmas is coming fast, this is a great recipe to do and master for the coming season. I love how you’ve given a very detail thought on this. The presentation is very good. I love eating gingerbread cookies myself. So I copied your recipe. I may not make the wreath though. We will just eat the cookies haha Thanks for sharing! OMG it looks amazing! So intricat and beautiful and not that difficult to bake either. Totally gonna have that on my list to bake this winter.